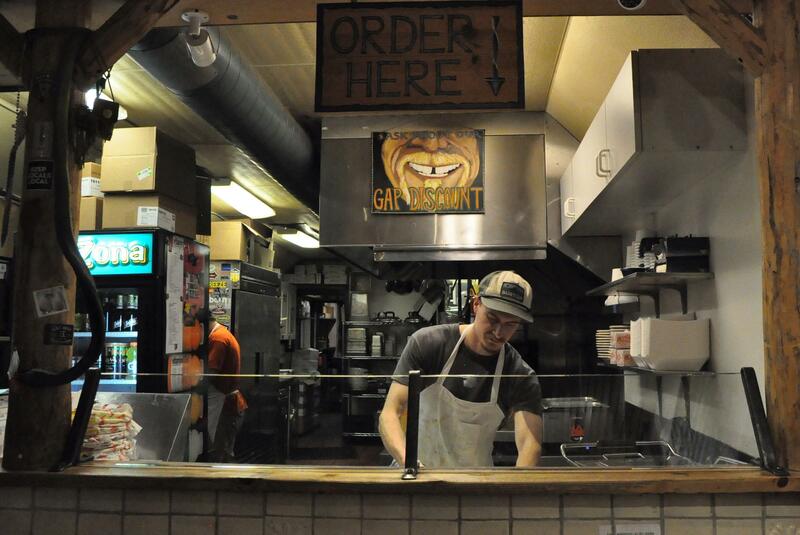 Josh Painter makes a burrito in a tamale shop in Crested Butte, Colorado. He moved to town after reading about it in a list of "America's last ski towns." But if the cost of living continues to rise, he's prepared to leave. Durrie Bouscaren hangs out with some "ski bums" -- a group of people potentially going extinct as the culture around skiing changes. "Ski fast, drive slow," a friend-of-a-friend chuckles, as the rest of us cower in the backseat of a massive Chevy Silverado. Even with the weight of five twenty-somethings and their gear, the truck fishtails a bit as it navigates a snowy county road just outside Crested Butte, Colorado. Jagged peaks in the distance show untouched, salivation-worthy snow above the tree line. The air is a humid, cakey cold -- the kind that makes you feel cocooned in a frosty wilderness. But when the road ends in a small clearing, next to a homemade terrain park, the place is packed: College kids from the next town over, dogs running after owners as they hit the jumps, and a couple of nine-year-old's who, at the rate they're going, could probably shoot for the 2026 Olympics. "It's like this ultimate freedom. There's no limit to it," sighed 26-year-old Joe Steckdaub, taking a break in a folding chair set up in the parking lot. "Everyone here is like, an undiscovered pro." Steckdaub moved to Crested Butte from California, right after high school. He lived out of his van at first, saving money and only renting an apartment once the weather turned freezing. He supplements his income selling skateboards that he designs himself. "First four years I was out here I was just, I would camp all summer long," he said. "It's nothing glamorous flipping cheeseburgers, but I make good tips." The modern ski bum faces two challenges: the reliability of income and the cost of housing. Up and down the Mountain West, some of the highest concentrations of service industry jobs are found in counties where the Big Ski is king: the waiters, hotel clerks and rental cashiers that make up the backbone of a resort economy. These wages are often subsidized with tips, which dry up when the tourists aren't there. And ski-related injuries that turn into unexpected medical bills aren't unusual. For a long time, the ski bum life in Crested Butte was relatively affordable, compared to other parts of Colorado. The four- to five-hour drive in from Denver was long enough to keep out the weekend ski commuters. This relative isolation built a community that prided itself on not being corporate, on not having any stoplights in town, on the rowdy annual parties like "Sleds and Kegs" and "Bridges of the Butte." 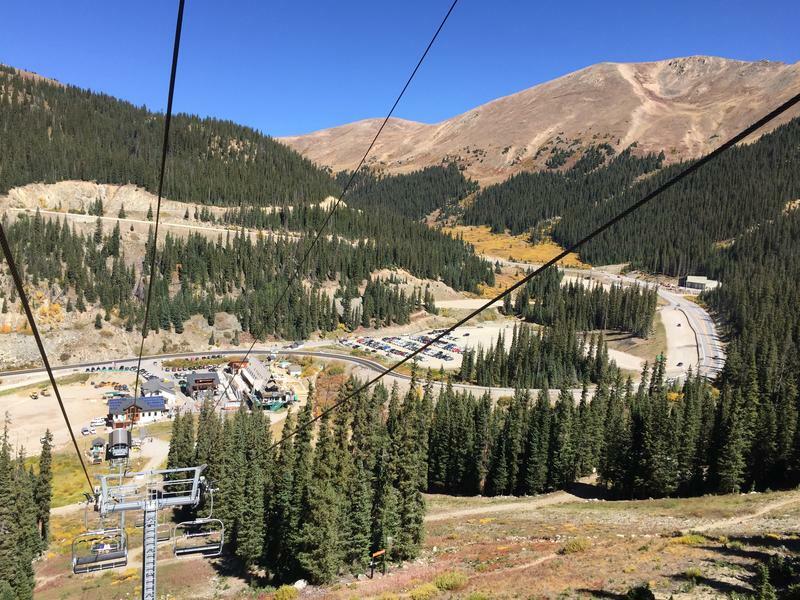 But earlier this year, corporate behemoth Vail Resorts announced that it would purchase Crested Butte, along with two mountains on the East Coast, in a deal that included $74 million and paying off the resort's existing leases. Locals say they hope Vail has the money to make improvements to ski lifts and a long-awaited trail expansion. At the same time, they worry an influx of tourists will take all the factors that make it hard to afford life here and shift them into overdrive. "One of the saddest things I'll do is I'll walk through town in April, and 90 percent of the houses are dark," said Katie Thomas, 31. "Because they're second homeowners." Thomas, a self-described second-generation ski bum, grew up here, back when the roads weren't fully paved and the former coal mining outpost still felt close to its roots. "I was living in a city, I was dating a lawyer. I was looking at the prospect of marriage and children and a white picket fence," Thomas said. "I realized I didn't want that. I wanted to ski and work in the same day. I wanted to be back in my mountains." Her rent started at $375 a month when she first moved back to Crested Butte. Now it's $825. Thomas says she worries Crested Butte will go the way of Aspen or Telluride, with the elite living in town and the workers commuting an hour or more. "Most of the businesses in this town are looking for work. But people can't move here and work because there's nowhere to live," she said. Thomas works seasonally behind the desk at a construction firm and nights at a distillery, serving craft cocktails and steaming bowls of fancy ramen. It's an uneasy balance, and one she maintains by hoarding wads of cash for the mud season. But it's a life she's committed to. For housing, full-time renters in ski towns have to compete with vacationers. The sticker price on a lower-end condo has almost doubled in the past five years, said Frank Konsella, a broker for Crested Butte-based Signature Properties. "The new Vail ownership of the resort could change things, but we won't know for another six, 12, 24 months," Konsella mused. "It'll be hard to say." Part of the increase, he adds, is due to the national economic recovery. Ski towns are particularly vulnerable to boom and bust cycles. "People were going to default on their second home before their first," Konsella said. "As a mountain town, we were significantly hit by the recession." To respond to these economic pressures and retain workers, some operators have built employee housing and boosted their minimum wage. 12 ski resorts in Colorado boosted their minimum wages this year, including Vail, from $11 an hour to $12.25. Many have sponsored foreign workers on special visas, though the program has since been reduced by the Trump administration. Still, the ski bum's resilience likely lies in their ability to adapt. Josh Painter, a snowboarder who cooks and serves tamales and burritos in a café, says that if things get too expensive or crowded, he'll leave. "You want to find the town that's going to be the next Crested Butte," he said. "Like, there's got to be some small, undiscovered ski town in Montana or something." Durrie Bouscaren is a freelance journalist who grew up in Fort Collins, Colorado. Previously she reported from Papua New Guinea as NPR's 2018 John Alexander Fellow and covered health care for St. Louis Public Radio. She lives in Istanbul. You can reach her through email and find her on Twitter @durrieB.